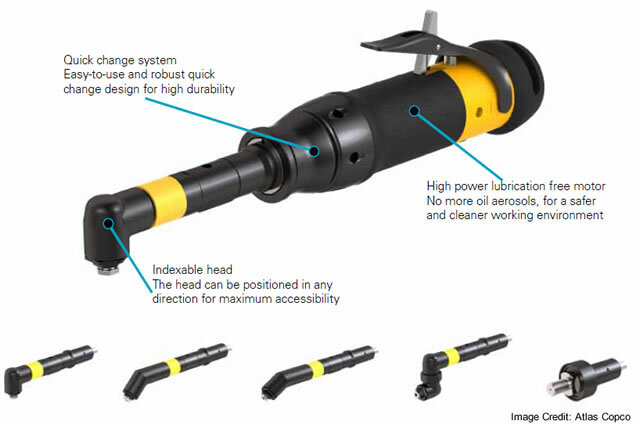 Atlas Copco has now released an exciting new version of its standard LBV16 angle drill designated the LBV16M. The M stands for “modularity” since the drill has interchangeable heads. This will make it particularly valuable for the aerospace industry and other applications where accessibility is a common issue in production. 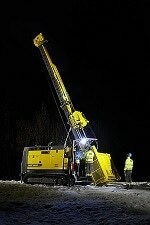 The LBV16M is designed to enable fast changing of angle heads. The user clearly feels when the quick change mechanism engages and can thus be confident that the angle head is securely attached. The drill is ergonomically designed for maximum operator comfort. The handle gives a comfortable grip without any sharp edges and is well insulated to protect the user from changes in temperature. The LBV16M features the same powerful motor, high quality angle head and light and compact design as the LBV16, and will be a reliable partner for a wide range of drilling applications. Atlas Copco is an industrial group with world-leading positions in compressors, construction and mining equipment, power tools and assembly systems. The Group delivers sustainable solutions for increased customer productivity through innovative products and services. Founded 1873, the company is based in Stockholm, Sweden, and has a global reach spanning more than 170 countries.